From anti-clockwise circles to letter formation, find out about your child's handwriting journey and how you can support them at home in TheSchoolRun's video, featuring experts from the National handwriting Association. 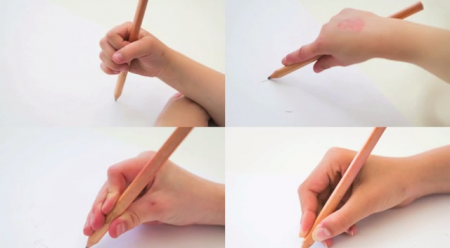 Experts from the National Handwriting Association explain what to expect at each stage of your child's handwriting development and offer suggestions for activities to help develop the hand muscles needed for comfortable, fluid handwriting. Children's handwriting develops over a long period of time, from the beginning of finger control in three- and four-year-olds to the capacity to control letters once they're writing regularly, and probably in a cursive (joined up) style, at the end of KS1. Forming anticlockwise circles When children first begin to draw circle shapes, they typically move the pencil in a clockwise direction. As they get older, this skill needs to evolve so that they start forming anticlockwise circles. This requires distal control - the ability to move the muscles of the fingers separately (i.e. moving the top joint of the fingers independently of the knuckles). This ability usually develops between the ages of four and five, and is the basis for being able to form all of the curly caterpillar letters (c, a, d, g, o etc). Forming crosses Ask your under-five to write some kisses in a birthday card, and they're likely to draw crosses with a vertical line intersected by a horizontal stroke. Even if you ask them to copy an X shape, they'll produce a vertical cross. But as they approach their fifth birthday, children begin to be able to form crosses that intersect diagonally at the mid-point: an essential skill needed to be able to write. These skills then gradually evolve as children develop better fine motor control, a more dynamic tripod pencil grip, and an understanding of letter shapes and formations, until by the age of six to eight, most can write reasonably and fluently and in a cursive style.